The tables and chairs shown were purchased from IKEA. This furniture is very light weight and also affordable for replacement. The kitchen area was donated by a family in memory of their child. 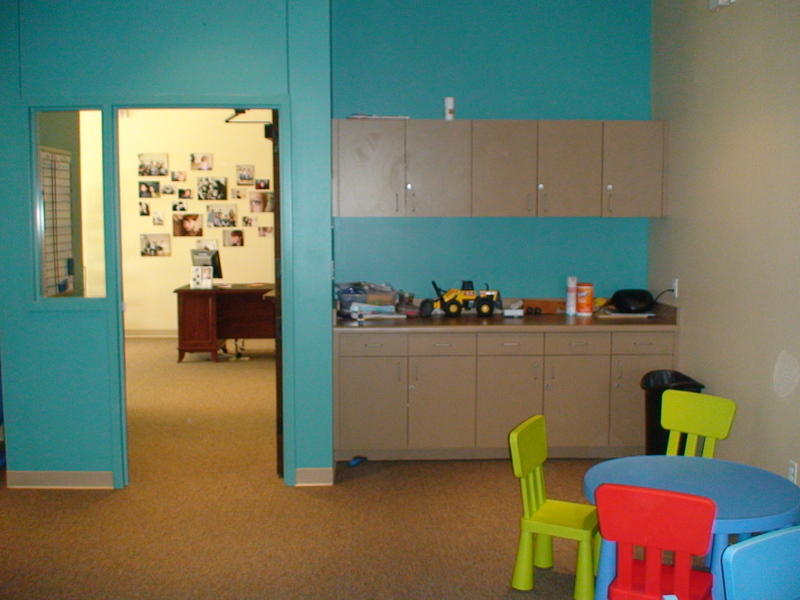 The television and video is displayed high enough so that it isn’t within reach of the children (extremely important!). 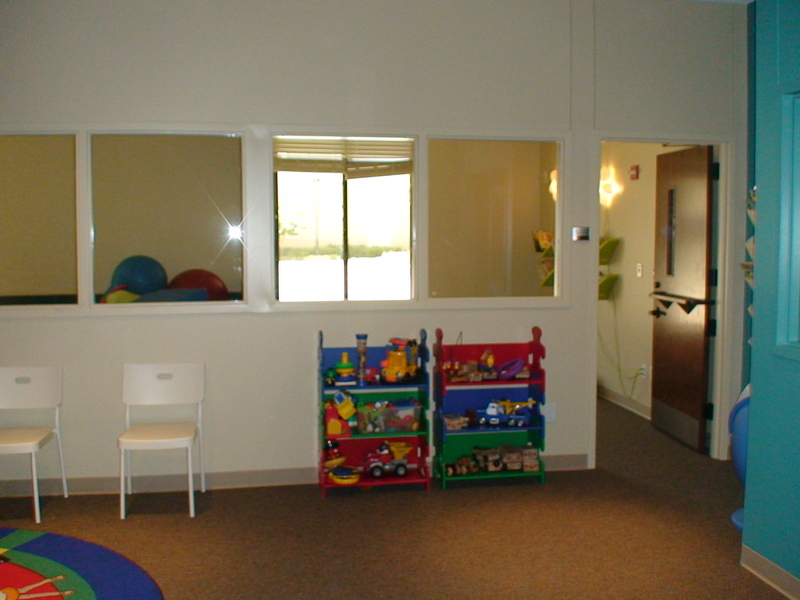 The monitor is also not on eye-level so to keep some children from becoming too focused on its presence. Meaghan noted that most students do not realize the TV is in the room and it is rarely used. Having the TV/video can be helpful for longer programming periods such as respite nights. A portable video player and monitor on a cart is also a good option because it is not physically present in the room. The square board to the right of the kitchen is the sensory board (also below). The above picture shows more detail on the sensory board. The entrance to the class bathroom is shown on the right. We’ll talk more about the bathroom in a future post. 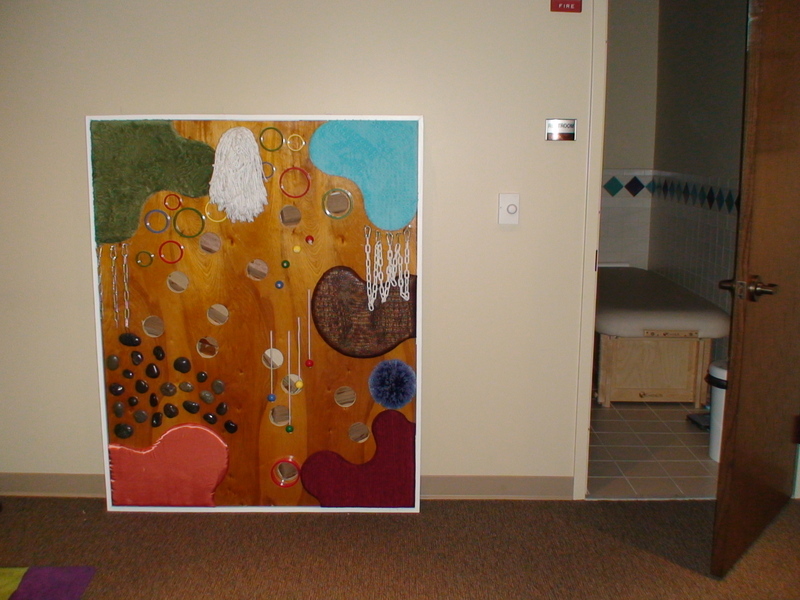 This sensory board was constructed by a church member who enjoys woodworking and small building projects. Many churches have men who are good with small construction projects…and asking for their help to create items such as this is a great way to involve others in the ministry. The four corners of the board have fabrics of different textures. You will notice a mop head and a duster head from general purpose cleaning items (likely found at Wal-Mart) that have been taken apart and then affixed to the sensory board. Smooth stones are also used in the left area of the board. Meaghan shared that some of the items were removed off the board when the kids were doing damage to those specific items. To see a sensory wall that you can purchase from TFH USA (or to get more ideas for building your own board), see this picture on The Inclusive Church’s Facebook page. In this picture (above) I’m standing with my back to the kitchen area/sensory board/bathroom and looking toward the classroom entrance and suite check-in area. Meaghan pointed out that the ministry made a conscious decision not to place a sink in the cabinet and counter. Water can be of great fascination to some individuals with neurological differences. Meaghan explained that they didn’t want the sink to be distracting for students who may want to play continually in water. As a result, the only sink in the suite is inside the bathroom and out of sight from the general play area. 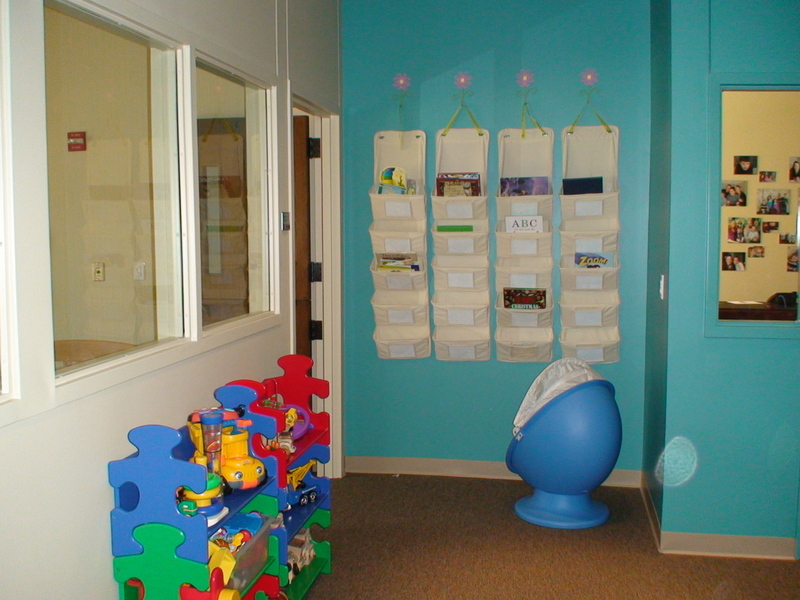 This picture (above) is taken from inside the main classroom and looking into the windows of two adjoining rooms: 1) a quiet room and 2) an inside sensory/play room. We will show pictures and talk more about these rooms in upcoming posts. This picture (above) shows a small pod chair (purchased from IKEA) and a storage system for books. I love the puzzle rack for toys…and no I don’t know the source for these shelves. 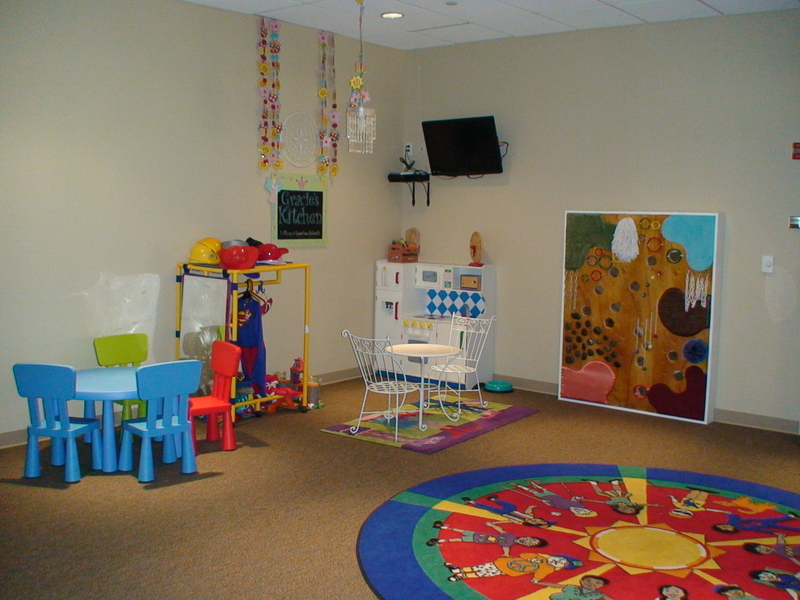 Defining space can be very important for a child who doesn’t innately understand personal boundaries. And giving an identifier on the rug helps the individual who may otherwise struggle to follow directions. 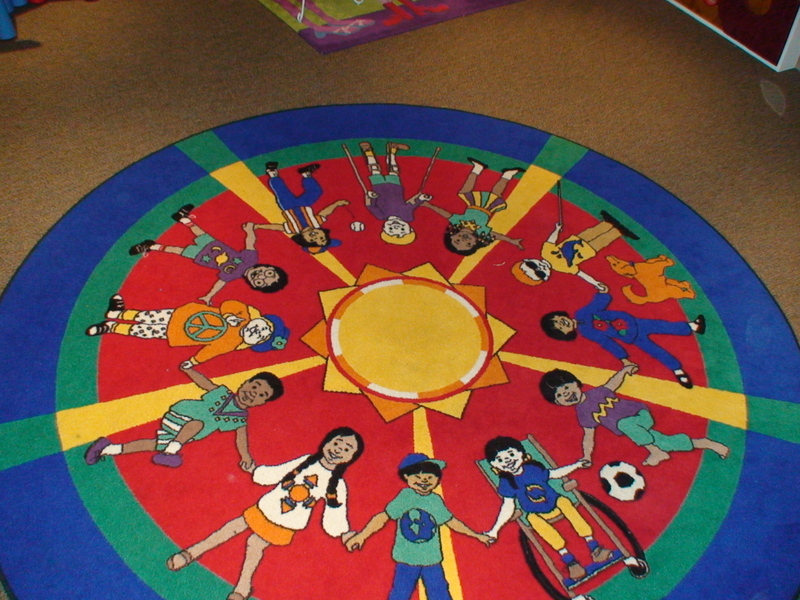 For children with auditory processing difficulty, their cue to go to the circle may come when they see the teacher point to the rug or by observing other students moving in that direction. 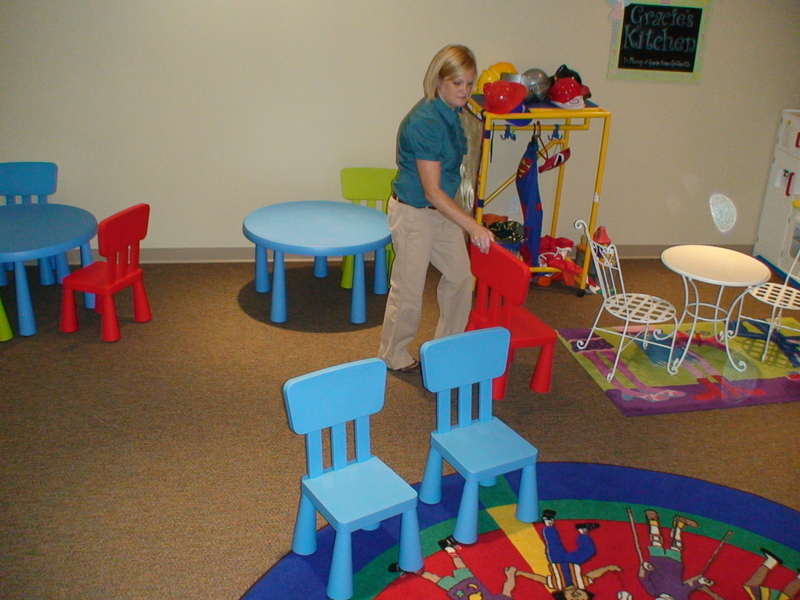 In this picture Meaghan is showing how they may place the chairs around the circle. Meaghan shared that their class uses a music curriculum (more to come about that) as a way of teaching scripture and Bible concepts to the children. Stonebriar’s special needs ministry has experienced wonderful success by using music as the primary tool for Bible teaching…as the children love the repetition and the movement that the music encourages. I will do a future post about the music curriculum Stonebriar uses. The circle time is done toward the end of programming for two reasons: 1) The music and story time tend to calm the children. This activity prepares them to go home with their family in a relaxed and self-regulated state. 2) When parents arrive to pick up their kids they are provided the opportunity to observe a few moments of their child’s spiritual formation. Meaghan shared that it is incredibly meaningful for parents to see their child participating in an environment where they aren’t just being babysat but rather are intentionally engaged and experiencing God’s word. I’m just crying reading this post…. that a church would put this much time and effort and love into an area devoted to special needs kids just overwhelms me. and I just want to reiterate that. She is so right. I find that so often the goal is just to “corral” or “contain” my son- very few attempt to really teach him in the way he learns. His teachers at school are amazing about this but he really has never experienced that at church. You would absolutely love Stonebriar Community Church. I have an upcoming post about their “Family Picture Wall” and the story behind it that will have you crying like a baby! 🙂 All in a good way. The church also helps to host a spa day for the moms of the kids participating in the special needs ministry. I’m telling you – this church does so many neat things to include and love on all these families. (Meaghan Wall and her team of volunteers are incredible). I am finding that churches in the Dallas, Texas area seem to be generally more advanced in terms of their special needs accommodation and inclusion. Stonebriar is not the only church that has a ministry of this scope and breadth. Just hang on…eventually this type of special needs ministry will be more common (even in Canada!). And thanks for reading the blog and for all your encouragement to me.